And many such benefits. You can even use the Nano Health Bio Energy Card to keep food fresh in your refrigerator. This Card is essential to ensure your peace of mind and relief from health problems. 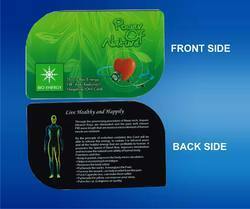 With the Bioenergy card in your pocket you can concentrate on living your life. Remember, prevention is always better than cure. Mam Digitalised Security Marketing Pvt.ltd.